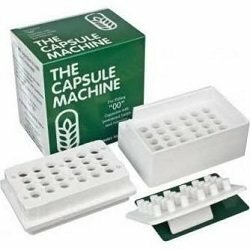 Making your own capsules has never been easier! This quality machine allows the user to fill 24 “00” size capsules at a time with botanical powders. The long part of the capsule is filled with empty, separated capsules that are placed into the base and the short part of the capsules are then inserted before completing the capping with the machine. A tamping tool comes with the kit to use for packing the powder into the capsules when filling. instructions to easily make capsules are included with The Capsule Machine. We offer empty vegetarian "00" size capsules in various quantities that are already separated for you. The amount dried ground powdered material needed to make 100 capsules is approximately 2 oz (about 60 grams).